Tina welcomes commissions to custom-design and construct mirrors handwoven from reeds and framed with bittersweet vine. Her mirrors can be constructed and woven for you in the dimensions, designs, weaving styles, and colors of your choice. The mirror pictured below is one example of a custom-crafted mirror by Tina. Contact Tina directly to commission a custom-designed mirror. 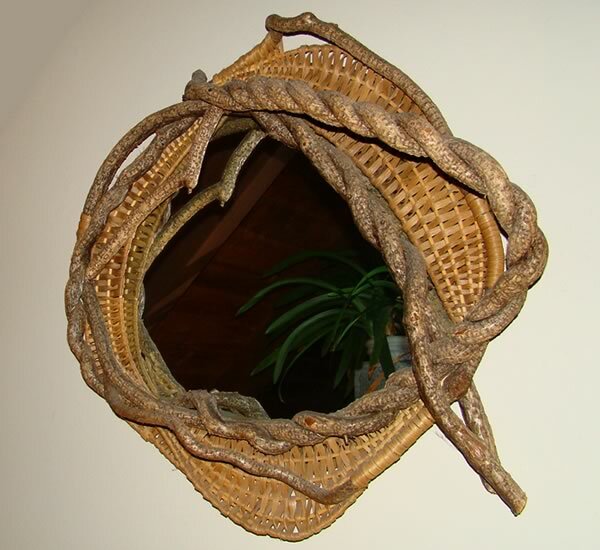 H 24" W 24" D 6"
A circular motion of handwoven smoke-colored reeds intertwined with bittersweet vine frames the glass of this very unique mirror.